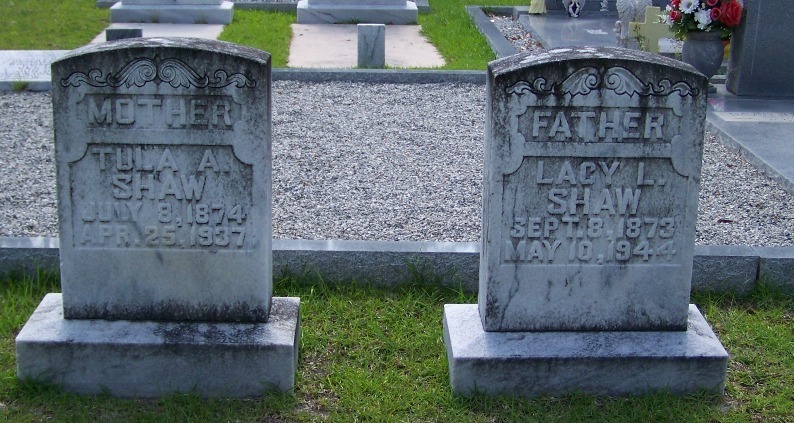 Lacy Shaw was brother to Arthur, Jesse “Dock”, and Chester Shaw. Lacy, Arthur, and Chester were in the turpentine business together, then after a falling out, Lacy and Chester were in business together and were quite successful. Chester was the strongest of the partnership, though the youngest. Chester was Berrien County Treasurer in 1909, 1910. In 1912, Chester ate a meal of quail and swallowed a quail bone and it lodged in his lower bowels and he died of gangrene of the bowels. He was 37. Lacy did not seem to have the same success without his partnership with Chester. He died near penniless.